Being London’s best luxury Hair and Beauty Salons makes us synonymous with having the very best products and expertise at our clients fingertips. But actually dry hair syndrome is compounded by two other things. One the shampoo you use (which ultimately affects the healthy of your scalp and hair follicle) and the other is wind ! Yes wind ! One of mother earths essentials to modern day eco recyclable energy, it can be stress on your hair. We’ve all experienced some kind of humidity frizz no matter whether you have long hair or short hair, the wind adds the dimension of drying out the hair inside out literally. Combine the drying effect with lowering autumnal temperatures the occasional damp misty rain (the sort that defies umbrellas) and hey presto, this creates an oxidizing affect on your hair follicle. 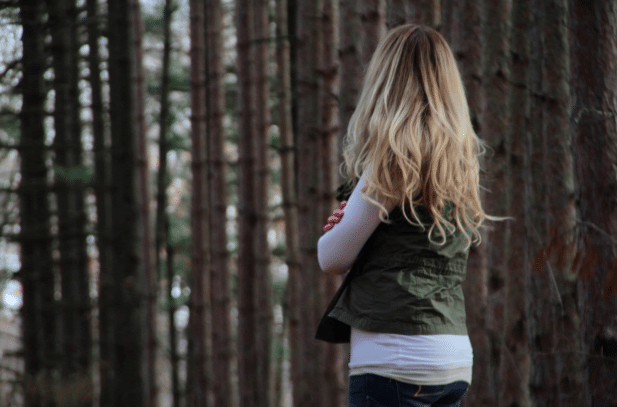 The outside of the hair exposed to a damper colder climate opens up due to the moisture, the wind has a speeding up affect oxidizing quicker and leaving little to no moisture in the hair. Vital lipids are lost so having the right shampoo to replace and protect your hair is a must. 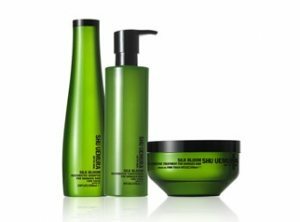 Shu Uemura Art of Hair has the answer with 3 ranges that are perfect for this hair weather challenge. Firstly Ultimate Remedy (ideal for ultra damaged hair types), is perfect for the autumn wind drying effect. 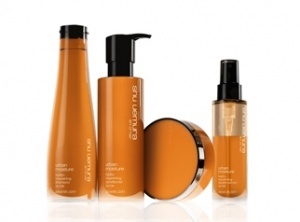 Containing lipids and ceremides, Ultimate Remedy shampoo, conditioner, masque and duo serum, has a formula that will add back lost lipids, temporarily attaching itself into the gaps in the hair follicle that have been created due to the oxidation, it also infuses the hair with lotus extract. The lotus plant/flower has a unique elastic molecular structure, this elasticity is perfect to act as the other half of the power couple to the lipids and ceremides that could otherwise add further brittleness to the hair follicle, keeping the hair malleable, shiny and nourished. Not only is all this great for your hair but it’s deep conditioning for your scalp too! Like skincare, moisturizers often contain lipid ingredients that help plump up and refresh your skin stopping it feeling dry and undernourished, the same happens to your scalp. Another great use for these products is to revive dry hair throughout your day. Take a pea size amount of the Ultimate Remedy Duo Serum in the palm of your hand, mix with a small amount of the Shu Uemura Essence Absolue to form a paste, and then apply from mid-way of your hair to the tips. You’ll immediately notice a difference in how your hair feels and looks. A naturally lightweight family of Silk Bloom shampoo, conditioner and treatment masque. The Silk Bloom formula contains Argan oil. Argan oil is a plant oil which comes from the kernels of the Argan tree. The oil itself contains phenols (fatty acids) and tocopherols (vitamin E), these organic chemical compounds have moisturising effects on hair, and can also ensure the hair is more resistant to oxidation and therefore less dry and brittle hair. It is a great range to intermix with your other shampoo needs, again like skin care antioxidant serums can be used daily or in between your moisturising regime, silk bloom is the same the conditioner or masque is a great add on to any shampoo to give the hair a little love and attention when you need it most. Third, whilst it is not necessarily your autumn saviour to dryness, Urban Moisture by Shu Uemura Art of Hair is a great panacea for the oxidative affect the environment has on hair. This family of Urban Moisture shampoo, conditioner, treatment masque and double serum is perfect for the individual living in dry heated environments and then exposing their hair to the outside elements and pollution. Containing red algae extract and moringa oil, this combination replaces lost minerals caused by oxidation and infuses the hair with moisture, both red algae and moringa oil are known for their detoxifying effect and on the hair, it can help cleanse and remove tiny pollutive particles that build up and significantly damage your hair, over time your hair will feel deeply nourished, without the heaviness that other rich moisturising shampoo ranges can have. 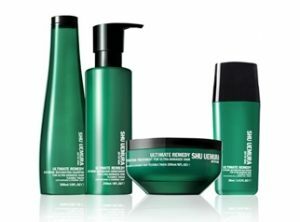 The full range of Shu Uemura Art of Hair is available at Paul Edmonds London salons and if you love it as much as we do you should try the in salon Masterbase Ceremonies. A bespoke prescriptive deep conditioning treatment that can lock in moisture, shine and repair for your hair, as your stylist the next time you are at our salons for this unique hair treatment, combined with the home care ranges you’ll never experience dry hair the same way again. If you’d like combat your dry hair and want to book an appointment with a member of our expert team, contact us today.